Pioneering New Ways to Capture Life. Images have always been important to science. The revolutions in biology and astronomy took off with the invention of the microscope and telescope, respectively. It was a new perspective on things. Images opened up whole new worlds to explore. In the study of botany and plants one of the main ways to capture nature was through paintings, drawings, and ecthings. And it’s a field that women have long contributed to. Botanical artists are still around today and still able to capture the world in ways that photographs still can’t. Two examples of famous botanical artists are Marianne North (You can buy prints of her stunning work!) and Beatrix Potter (who might be better known for her children’s stories). An even earlier example is Maria Sibylla Merian. Another way of ‘imaging’ plants is to press and dry them as herbarium specimens, which are also still important today beyond just documenting how a plant looks. Best of all, of course, is to document things in multiple ways to fully capture the richness of the plant itself. We take photography for granted today. And it is becoming ever more important in today’s information-driven world. Cameras of all kinds do a lot for us (both still and moving images). They are how we monitor a lot of things. And it all started in the early 19th century. And a repository of plants were the subject of the first book to include images of any kind. 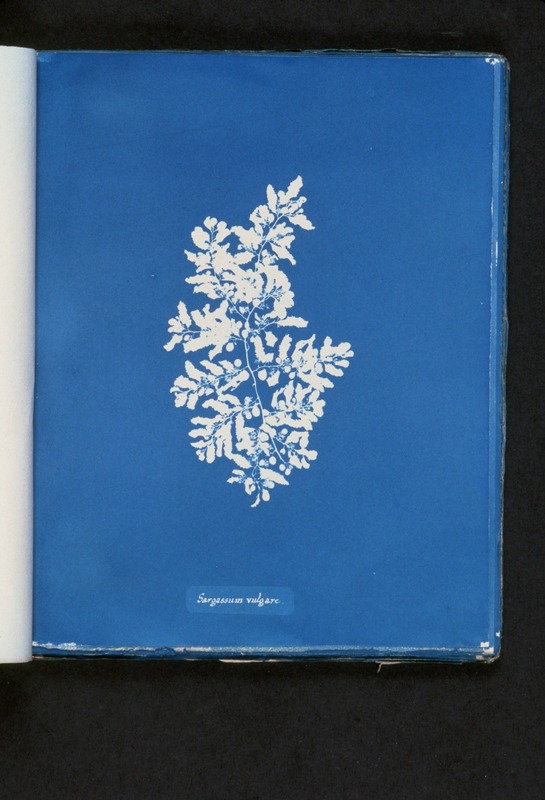 It’s author was Anna Atkins and it was a book of seaweed/algae from around the UK. The imaging method she used was one developed by John Herschel, the son of William Herschel, both intellectual giants of their time, and both associated with a woman who also contributed to the history of science. In William Herschel’s case it was his sister, Caroline, who became an astronomer in her own right. 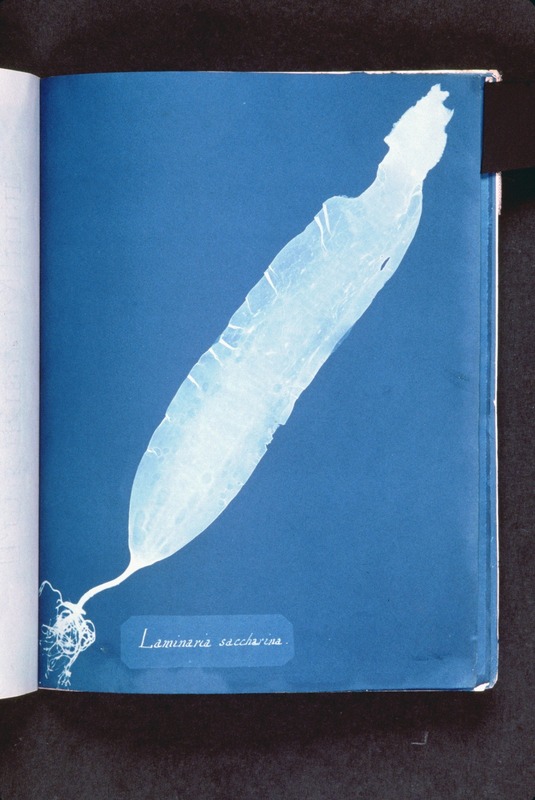 John Herschel shared with the already-budding photographer Anna Atkins his cyanotype technique (perhaps indirectly) that she used to image seaweed/algae. The New York Public Library (they’re worth following on Instagram– @nypl), has some of her cyanotypes in their digital collection and they are really cool. The problem cyanotyping solved was how to store a photographic image longer-term than the initial exposure to the photosensitive surface (or how to create prints of a negative– and generate copies). The technique Atikins used was the photogram technique. She’d prepare the chemicals, a mix of potassium ferricyanide and ferric ammonium citrate and paint them on a surface (usually paper), letting it dry in the dark, and then placing the subject to be photographed directly onto the paper and exposing it to light. The paper turns blue except where the subject is, which is white. This sounds like a pain-staking process, but Atkins produced hundreds of them. it was faster than engraving, something Atkins had done with her father when working in his lab. A lot of her cyanotypes are really beautiful. Atkins cyanotype of Halymenia furcellata. From NYPL digital collections library. 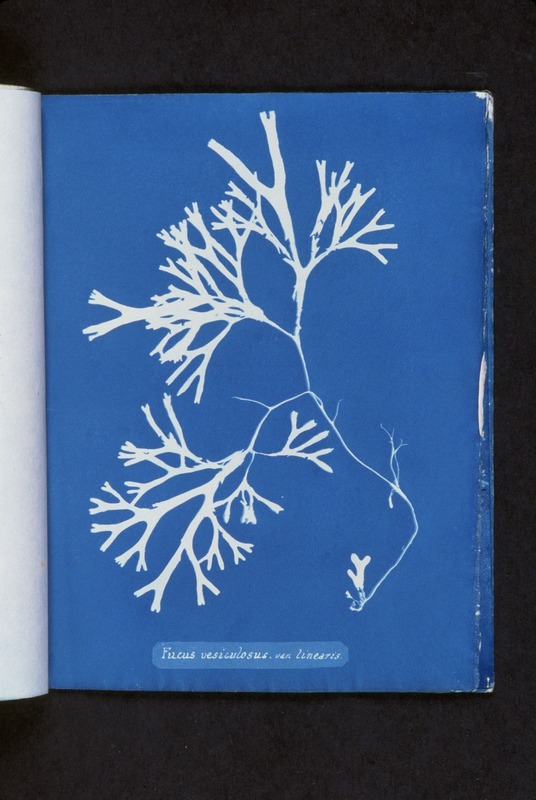 Sargassum vulgare From the NYPl Digital Collections. Laminaria saccharina. From NYPL Digital Collections. Fucus vesiculosus var. linearis. From NYPL Digital Collections. The entire collection can be found at the New York Public Library’s Digital Collections. Atkins was in a perfect place to take advantage and pursue her interests in imaging and plant collections (something that was a big at the time). Her father introduced her to science and knew other scientists of the time, including Herschel. And the men at least seemed willing to teach her about the newest in technology at the time, even while likely excluding her from universities and the Royal Society itself. The result was an image of plants that happened to be the first photographic collection published. 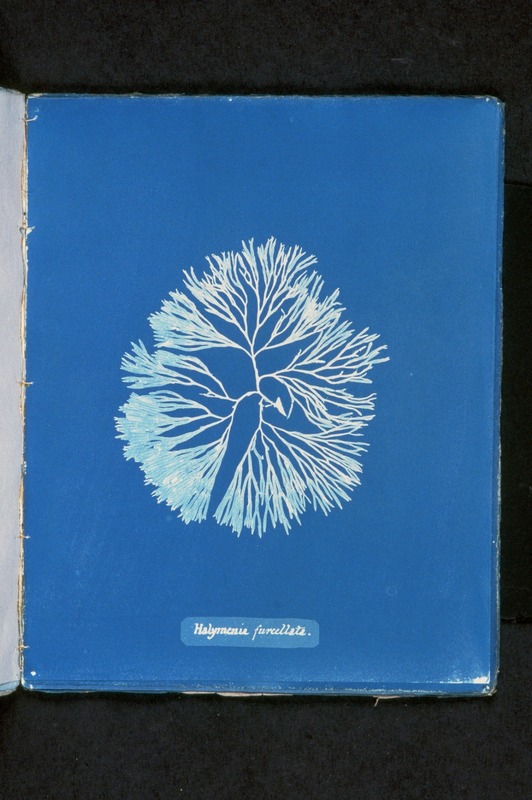 A lot of the algae cyanotypes really look a lot like Darwin’s famous ‘I think…’ drawing of how species might all be related to one another. That is probably a coincidence. But John Herschel did meet Darwin when the HMS Beagle stopped in South Afirica while Herschel was there doing some botanizing, but also mapping the Southern skies, part of what made his legacy. I don’t know what Darwin had on his bookshelf, and he may never have seen Atkins published work, but it fascinates me that all of these English scientists and tinkerers had such close connections to one another. Next time you see a photo or a painting/drawing of a plant, remember the long legacy it’s a part of and that there are talented women that have contributed a lot to the field, even before modern times. Percy Julian, Natural Products Chemist. Pingback: Plant Genomes of 2016.